New Free users are allowed 50 passwords per device. You keep your existing passwords. 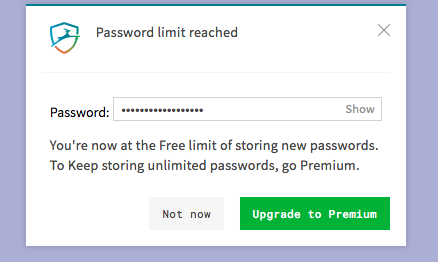 If after your Free Premium trial period you have more than 50 passwords on a device, you keep your existing passwords, but simply cannot add new ones. You can update your existing passwords. For example, if Dashlane sends you a security breach alert, we recommend that you immediately change your password on that account, and naturally we allow you to do so! You can always update your existing passwords. Depending on your platform, you will be informed as you approach or have reached your limit when you create a new password. Note that if you try to create a new password and you have already reached your limit, you will not be able to save it to your device. Be sure to click on "Show" and note the password you just created, even if you plan to upgrade to Premium right away. If you have more than 50 passwords to manage or use multiple devices, we encourage you to use Dashlane's full potential to make your online life easier while improving your security. Dashlane Premium offers unlimited passwords, secure synchronization between your devices, Dark Web Monitoring, VPN protection, and many other features designed to help you truly take control of your digital identity. Click here to find out which Dashlane plan is best for you.